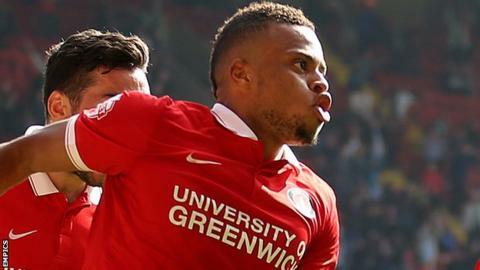 Jordan Cousins' spectacular injury-time header completed Charlton's fightback to earn a 2-2 draw in their London derby against Fulham. Johnnie Jackson started the comeback from 2-0 down with a thumping header from a corner late in the second-half and Cousins levelled in stoppage time. Fulham looked odds on to win when Ross McCormack netted the visitors' second from Ryan Tunnicliffe's pass. Tunnicliffe had given Kit Symons' side the lead with his first-half effort. Finishing looked to be the difference between the two sides for the majority of this game, and both will look back on missed opportunities to put the game beyond sight, particularly the visitors. After winning three of their opening four games this season Charlton have slid down the table, but perhaps should have taken the lead when Conor McAleny shot wide in the opening minute. Instead they found themselves behind when Tunnicliffe tucked away from close range after Nick Pope failed to hold McCormack's low shot to give the visitors a half-time lead. McCormack's shot skidded wide shortly after the break and Jamie O'Hara fired high and over the bar while Charlton also had chances as Tony Watt and El-Hadji Ba both stretched Andy Lonergan with shots. Moussa Dembele's 25-yard curler clipped the bar as Fulham sought to close out the game, and a second did come when the same player flicked onto Tunnicliffe down the left, and the ball into the box teed up McCormack to fire in his seventh goal in eight games. After further half-chances at both ends, Jackson bulleted in a header from a corner to give the hosts hope and having peppered the Fulham goal, Cousins popped up with a crucial equaliser, diving bravely to meet a centre as injury time ticked away. Watt might have won it had Fulham defender Richard Stearman not made a crucial intervention before the whistle blew to confirm the points would be shared. Charlton coach Guy Luzon: "It was not easy for us to respond because of our last results but Johnnie [Jackson] joined the game and influenced immediately the result. "He scored then we had great chances to score a second one. We did that and Tony (Watt) at the end had the chance to win the game. "After being 2-0 down it's great to come back with a point but we deserved more than one point." "I am not worried [about Nick Pope's error]. I will give backing to all my players, mistakes are part of football. Nick Pope will continue to play." Fulham manager Kit Symons: "I'm incredibly disappointed. To be 2-0 up and dominant in the game and cruising to then throw it away is inexplicable. "There's no excuse. We should have gone on and got a third and killed the game off. We made poor decisions; don't take those chances when they come. If that's the case you've got to do the job right at the other end. "Two free headers: two points thrown away. Up to the last 10 minutes we never looked in any trouble whatsoever. "Defining moments in games: the crowd were singing for Johnnie Jackson to come on about 15 minutes earlier. He suddenly came on, made an impact, gave them a big lift. They took advantage of that and we shot ourselves in the foot." Match ends, Charlton Athletic 2, Fulham 2. Second Half ends, Charlton Athletic 2, Fulham 2. Corner, Charlton Athletic. Conceded by Richard Stearman. Attempt blocked. Tony Watt (Charlton Athletic) left footed shot from the centre of the box is blocked. Assisted by Johann Berg Gudmundsson with a through ball. Attempt blocked. Luke Garbutt (Fulham) left footed shot from outside the box is blocked. Assisted by Ryan Tunnicliffe. Goal! Charlton Athletic 2, Fulham 2. Jordan Cousins (Charlton Athletic) header from the centre of the box to the high centre of the goal. Assisted by Karlan Ahearne-Grant with a cross. Delay in match Jazz Richards (Fulham) because of an injury. Attempt missed. Karlan Ahearne-Grant (Charlton Athletic) right footed shot from the centre of the box is too high. Assisted by Jordan Cousins with a headed pass following a corner. Corner, Charlton Athletic. Conceded by Jazz Richards. Corner, Fulham. Conceded by Johnnie Jackson. Attempt blocked. Cauley Woodrow (Fulham) right footed shot from the centre of the box is blocked. Assisted by Lasse Vigen Christensen. Attempt blocked. Karlan Ahearne-Grant (Charlton Athletic) right footed shot from the centre of the box is blocked. Assisted by Johann Berg Gudmundsson with a through ball. Attempt saved. Cauley Woodrow (Fulham) left footed shot from the left side of the box is saved in the centre of the goal. Assisted by Ross McCormack. Attempt missed. Tony Watt (Charlton Athletic) right footed shot from the right side of the box misses to the left. Assisted by Jordan Cousins. Attempt missed. Franck Moussa (Charlton Athletic) header from the centre of the box misses to the right. Assisted by Johann Berg Gudmundsson with a cross following a corner. Corner, Charlton Athletic. Conceded by Jamie O'Hara. Attempt blocked. Jordan Cousins (Charlton Athletic) header from the centre of the box is blocked. Corner, Fulham. Conceded by Zakarya Bergdich. Attempt saved. Jordan Cousins (Charlton Athletic) right footed shot from outside the box is saved in the centre of the goal. Assisted by Zakarya Bergdich. Goal! Charlton Athletic 1, Fulham 2. Johnnie Jackson (Charlton Athletic) header from very close range to the high centre of the goal. Assisted by Johann Berg Gudmundsson with a cross following a corner. Corner, Charlton Athletic. Conceded by Lasse Vigen Christensen. Attempt blocked. Tony Watt (Charlton Athletic) left footed shot from outside the box is blocked. Assisted by Zakarya Bergdich. Attempt blocked. Jamie O'Hara (Fulham) left footed shot from outside the box is blocked. Assisted by Cauley Woodrow. Substitution, Fulham. Cauley Woodrow replaces Moussa Dembele. Attempt missed. Luke Garbutt (Fulham) right footed shot from the centre of the box is high and wide to the right. Attempt blocked. Lasse Vigen Christensen (Fulham) left footed shot from the centre of the box is blocked. Assisted by Moussa Dembele with a headed pass. Substitution, Charlton Athletic. Franck Moussa replaces Conor McAleny. Corner, Charlton Athletic. Conceded by Luke Garbutt.